Announcing: An Early Look at Hank #66! First off, thank you to everyone who asked for information about Hank #66! It's been in-the-works behind-the-scenes for the past few months... and we're happy to be able to announce some details today! "Hank is in real trouble this time. Loper and Sally May’s relatives are coming for Christmas dinner, and Sally May has been working to get the entire ranch in order – including preparing for the Christmas feast. 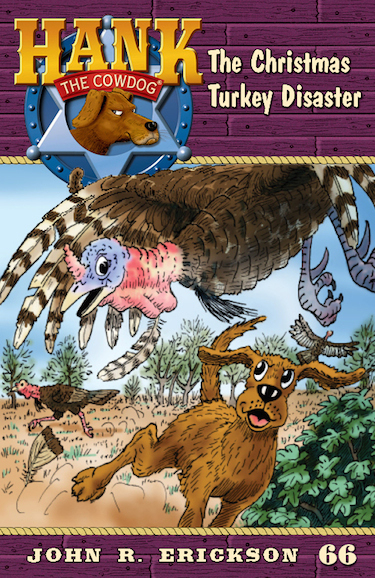 Unfortunately, when she discovers that the turkey she bought has met a terrible end, she pins the blame on Hank! Is he the guilty party? Or have more sinister forces been at work to frame him for the crime? Later that day things seem to be looking up, that is, until the replacement Christmas turkey “flies the coop” too, landing Hank in even deeper trouble! Can an act of true heroism can right the terrible wrong and salvage Hank’s reputation, or is he doomed to spend the rest of his doggie days in exile?" Are you as excited as we are to read Hank's next adventure? !